A timeless addition to your decor, our handcrafted American Heritage Five Drawer Chest boasts a classic antique design, along with modern luxuries that will stand out in any bedroom you choose. 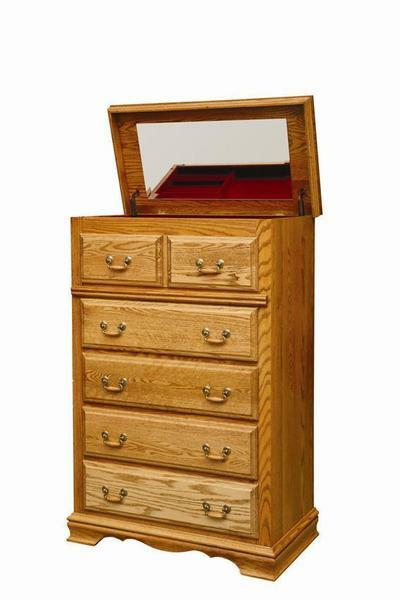 The classic five drawer design provides plenty of space to store your bedroom necessities, while the optional lift top creates a hidden jewelry box that will flip open to reveal a mirror and felt lined trays to store all your keepsakes and expensive pieces. Each drawer in this chest is mounted with a full-extension, soft-close drawer slide, offering you complete access to anything you may need inside. A simple push to close the drawer engages the soft-close mechanism that will take over and glide the drawer box to a silent, complete close. Customize your new American Heritage Drawer Chest by choose from one of the four premium hardwoods available. Once selected, choose from an array of different stain options to add you touch to the pieces. The hardware, as shown, does come standard, but can be changed out as well. Please call one of our Furniture Specialists today to request stain samples, place your order by phone, or request a free custom quote for any alterations needed on this magnificent drawer chest.